Does Exercise Really Curb Appetite? Exercise has been proven to be a powerful weight loss tool, but can it also make us feel less hungry? New brain science research shows that people react differently to food after exercise depending on their weight. LAP-BAND VIP Dr. Shahram Salimitari gives advice on how to battle hunger after exercise. 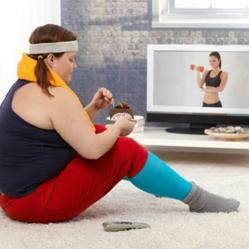 Fit or fat, exercising changes the way a person thinks about food after their workout. A recent study showed the regions of the brain which determine the appeal of food lit up for those who sat around, but brain scans of the people who exercised showed less interest in eating food after working out. Although it was indicated in previous research that hormones alone were responsible in the desire for food, researchers now say the brain has a greater role. Hormones which regulate appetite and determine when to start and stop eating include ghrelin, leptin and insulin. The impact of exercise on brain activity is a new area of study, said Todd A. Hagobian, professor of kinesiology at California Polytechnic State University. Researchers concluded that the brain is affected by exercise in different ways, depending on the individual and the type of exercise they do – whether short or long term. Published in The Journal of Applied Physiology, the study included a group of young men and women. One group exercised briskly for an hour while another group of people sat for an hour. Afterwards, both groups were analyzed by functional MRI coils, used to measure brain activity, as the volunteers were shown images of food. Food was less appealing to study volunteers who had exercised for an hour beforehand, while those who sat for an hour experienced increased activity in the brain’s food-reward center. This was especially true for high-calorie foods. Surveys completed by study participants showed a decreased interest in food following exercise. However, this may not be the case for obese people. In a similar study published last year in The Journal of Obesity, overweight men and women were examined for exercise-induced changes in the brain. It concluded that some obese people are less interested in food after exercising while others responded enthusiastically to the sight of food and were more likely to seek out high-calorie fare. This isn’t to say obese people should avoid the treadmill. Graham Finlayson, lead researcher of the study conducted at the University of Leeds in England, said the volunteers in the five-week study all showed health benefits from the exercise program. How exercise affects the desire for food is still a new area of study. Researchers know very little about food reward regions of the brain and how exercise may impact them, and whether responses are different in the obese versus normal-weight people. Even though this research is in its infancy, a solid conclusion has been made: people who exercise more weigh less in part because of their relationship with food. "The benefits of exercise cannot be ignored, especially for those who are overweight," said Dr. Shahram Salimitari, a weight loss surgeon in Los Angeles, California. "Such benefits included smaller waistlines, lower blood pressure and less insulin sensitivity. Someone who is overweight may be more likely to want to overeat after exercising, but simply being aware of this fact can aid them in their weight loss efforts." It is crucial to maintain a balanced diet for both health and wellness. For more nutritional and exercise tips visit the LAP-BAND VIP Facebook page at http://facebook.com/lapbandvip.